The Journal of Student Affairs in Africa (JSAA) is an independent, peer-reviewed, multi-disciplinary, open-access academic journal that publishes scholarly research and reflective discussions about the theory and practice of student affairs in Africa. 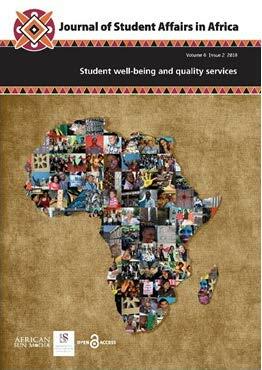 JSAA aims to contribute to the professionalization of student affairs in African higher education. It strives to be the foremost academic journal dealing with the theory and practice of the student affairs domain in universities on the African continent, and an indispensable resource for the executive leadership of universities and colleges dealing with student affairs, deans of students and other senior student affairs professionals, as well as institutional researchers and academics and students focused on the field of higher education studies and student affairs. JSAA is published twice a year by the Editorial Executive in collaboration with African Sun Media and the University of Stellenbosch. The editorial and peer review policy adheres to the Code of Best Practice in Editorial Discretion and Peer Review for South African Scholarly Journals (Academy of Sciences of SA Council/ASSAf 2008). JSAA is published online and in print. Authors publish free of charge; there are no processing or page fees. Please register for alerts about new issues and opportunities. The JSAA Editorial Executive apologises for the current backlog in the processing of manuscript submissions. JSAA has received a large amount of new submissions in the past 8 months and we will strive to respond to all authors in the next days.